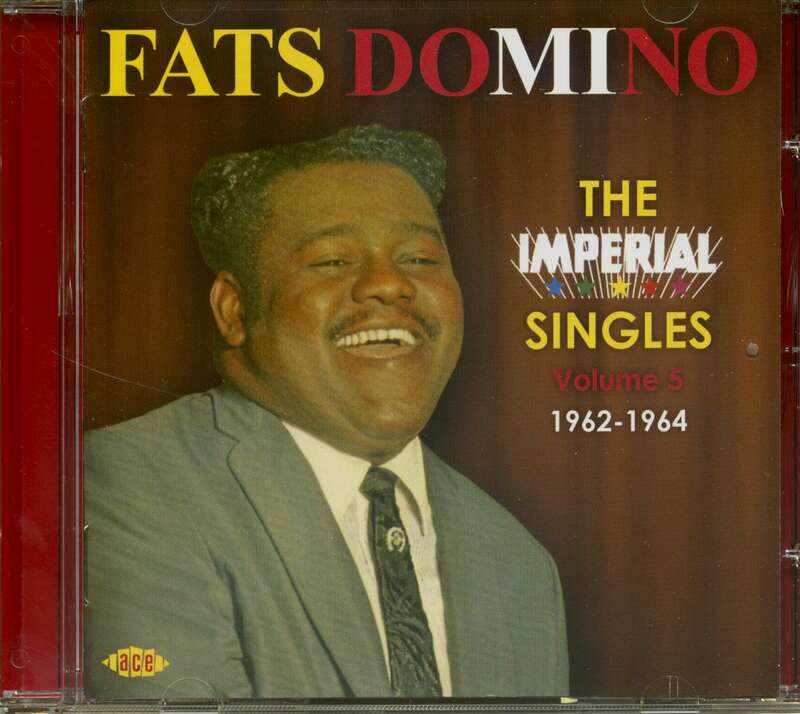 The fifth and final volume in the Fats Domino Imperial singles series takes us up to 1964, and as usual covers all the A and B-sides and includes a couple of contemporary album tracks in stereo for good measure. 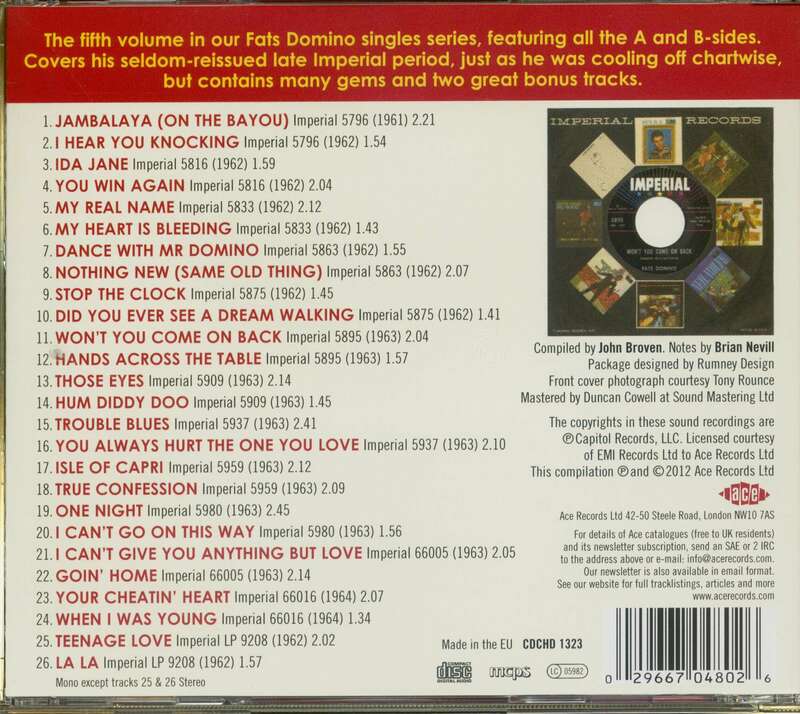 The rest of the CD is in original mono and never waivers from the true singles masters as they were issued in the US. 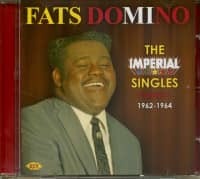 This volume covers the period just as Fats was cooling off chart-wise and includes singles released on Imperial after he had left for ABC Paramount in 1963. This is the least reissued period of Fats Domino but contains many gems. The booklet is packed with great pictures, period advertising and detailed information, and is a handsome companion to the previous volumes and completes the set. 1961 had been a good year for New Orleans R&B, with hits by Joe Barry, Ernie K-Doe, Clarence 'Frogman' Henry, Chris Kenner and Fats, but things started to cool off in '62 for our man. It was as if after ten years of hits for him, the gates were swinging open to a plethora of talent from New Orleans and Louisiana. 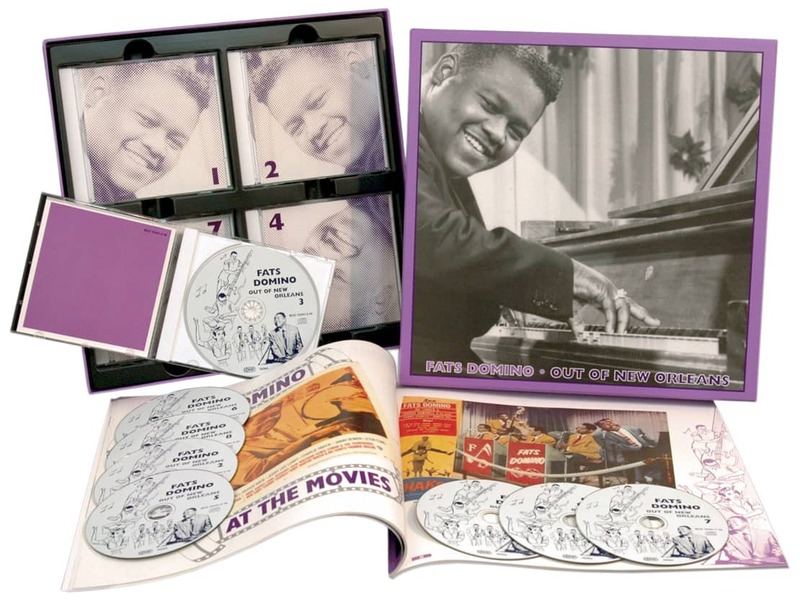 As the 60s progressed this presence continued to be felt, with hits by Jessie Hill, Lee Dorsey, the Dixie Cups and others, while Fats’ star waned, exacerbated by a change of record company and a change in the listening tastes of young record buyers, but in retrospect it’s clear that the decline in hit records was not reflected by a drop in quality. 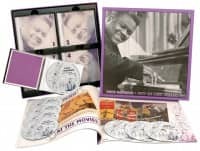 The sides here include ‘Jambalaya’, ‘You Win Again’ and ‘Your Cheating Heart’, Fats' take on the great Hank Williams, at a time when Ray Charles was changing the face of R&B with covers of country material, some great New Orleans R&B in ‘I Hear You Knocking’, ‘You Always Hurt The One You Love’ and ‘Goin’ Home’, and superb original songs such as ‘My Real Name’, ‘Dance With Mr Domino’ and ‘Did You Ever See A Dream Walking’ – all in all a veritable feast of Fats at his best. 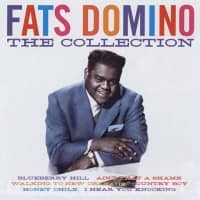 Fats’ albums were still strong sellers, and from 1962’s 'Just Domino' we have included ‘Teenage Love’ and ‘La La’ – as they were released at the time in stereo, we have included stereo masters in this collection. 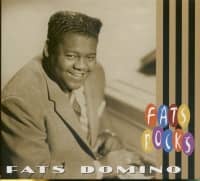 Fats Domino has a larger than life profile following Hurricane Katrina, and he and his producer/songwriter Dave Bartholomew have been honoured by the Rock and Roll Hall of Fame. 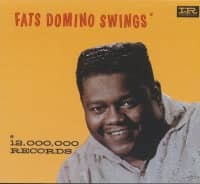 Today Fats’ name is up there with the great surviving rock’n’roll legends. Now’s the time to complete your library of his Imperial singles. Rest assured, take any volume from the series and you will never be less than happy, and more than likely be ready to get up and dance! Customer evaluation for "Vol.5, Imperial Singles (CD)"